Last year twelve former Australians of the Year wrote a letter to Prime Minister Malcolm Turnbull calling on the government to act over the “human disaster” at the former refugee detention centre on Manus Island. This treatment does not represent who we are as Australians, or indeed as human beings. This Australia Day many people are thinking about Indigenous dispossession. It’s also an opportunity to think about people who are imprisoned, yet have done nothing wrong, committed no crime, and who are even denied a trial, fair or otherwise. Especially consider the plight of refugees and people seeking asylum, people who, in earlier times, have contributed so much to make Australia great. It is a good time to consider Australian values. Where is our Australia “fair”? What is happening to our Australian values? Whatever happened to the Fair Go for all? We are losing the right to transparent government, to habeus corpus, to fair trial, to nobody being above the law. We are being deliberately divided. The vulnerable members of our communities are being trampled on and manipulated as political playthings. Minorities are being scapegoated. The tune to those words we sing was written by Tommy Tycho, a Jewish refugee who came to Australia after experiencing, as a 15-year-old boy, the horrors of a forced labour camp during WWII. Australia gave him a chance to shine, to contribute. In the lead up to Australia Day, Rural Australians for Refugees has launched a letter writing campaign. Justice4Refugees are supporting the campaign. It’s time to take a stance, for all good people to stand up and take action. So please consider writing to your MPs and Senators, and city and regional papers. Link to the Letter Blitz here . . .
President Stuart McMillan has expressed solidarity with Australia’s African community in the wake of recent negative political and media commentary. “Fear and negativity are such a blight on our public life. I find it deeply regrettable and offensive that some of our political leaders and media have begun the New Year by demonising a group of young African men,” said Mr McMillan. “Our politicians and media need only lift their eyes to the wonderful African communities of faith to find positive role models and affirmation. 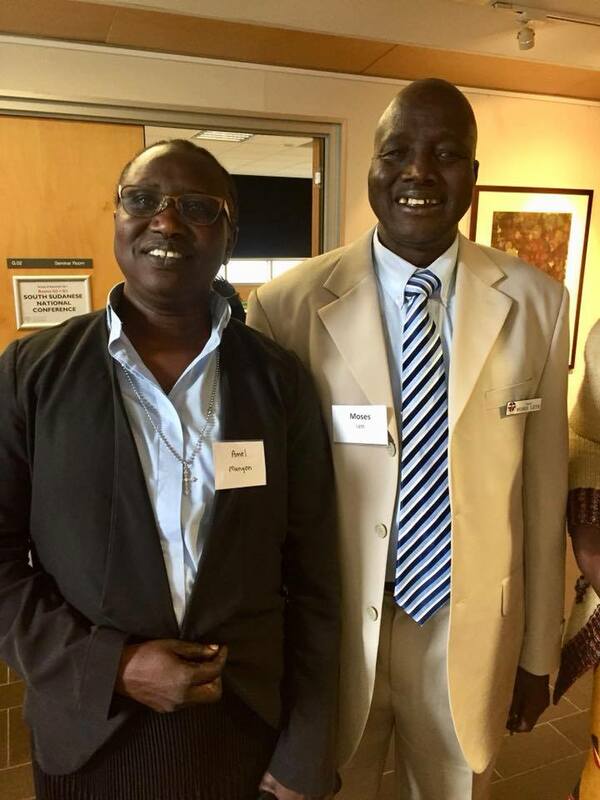 “If, as I have, they attended a gathering of the Uniting Church’s South Sudanese National Conference, they would see a young, enthusiastic community, rising up from the difficult circumstances of settlement and growing young leaders. “At two national gatherings in Brisbane in 2015 and at Hoppers Crossing in Melbourne in September 2017, I have marvelled at their faith and resilience. “At Hoppers Crossing last year young people from the Nuer-speaking Faith Community in Brisbane led the opening worship. “There was much sharing on what it means to be the reconciling people of South Sudan living in Australia. Ideas were shared on practical ways to bring about greater unity among their communities. Young people under 30 also stepped up – taking up half of positions on the new executive for the South Sudanese National Conference. “South Sudanese in Australia are taking their future into their own hands,” said Mr McMillan. Rev. Manyon is the first South Sudanese woman to be ordained in the Uniting Church. “I look forward with great anticipation to the contributions young African women and men will make in a diverse Australia,” said Mr McMillan. Rev. Amel Manyon from Adelaide’s Dinka-speaking Faith Community says she finds the commentary disappointing. “I don’t support crime being committed by our young people, but I want the public and the politicians to open their eyes also and see the other side,” said Rev. Manyon. “Nobody pays attention to those achievements and their contribution to the Australian community. In 2017 our community in Adelaide celebrated the academic achievements of our young people – Masters degrees, Bachelors degrees, and Year 12 graduations. “In the sporting arena, our young people are performing at high levels in basketball, soccer, football and wrestling. They are also involved in cultural activities and performance: singing, drums, dance, and so on – and they are involved in church leadership. “I am not denying that some of young people are struggling with studies, some are brought up by parents who also struggle with settlement issues such as language and lifestyle. “But that does not mean that all African Australians are what the Australian politicians and media think. We should not all be painted with the same brush. Pastor Moses Leth has led the Nuer faith community at St David’s Coopers Plains in south Brisbane for the last 15 years. He says holistic ministry is required to address the challenges faced by young members of his community. “We are looking to develop strategies that afford African Australian young adults opportunities to explore and develop to their full potential, as well as offer them protection from drugs and violence. “We are trying to encourage young people by including them in discussions and decision-making concerning the church, and most importantly, listening to their ideas and views. I enter this new year with hope. Yes, there is reason to be discouraged. of evil, greed and violence. that God’s future is already present. and the darkness can’t overcome it. by corporations and their kept legislators. God is alive and at work in this world. are rising up, finding their voice, taking their place. but we will never see the darkness win out. Love always has more to say. ourselves signs of the very hope that sustains us. for God is here, and God’s world is still becoming.